To purchase Field Guide for Saturday, September 17th, 2016 as a ONE DAY EVENT. 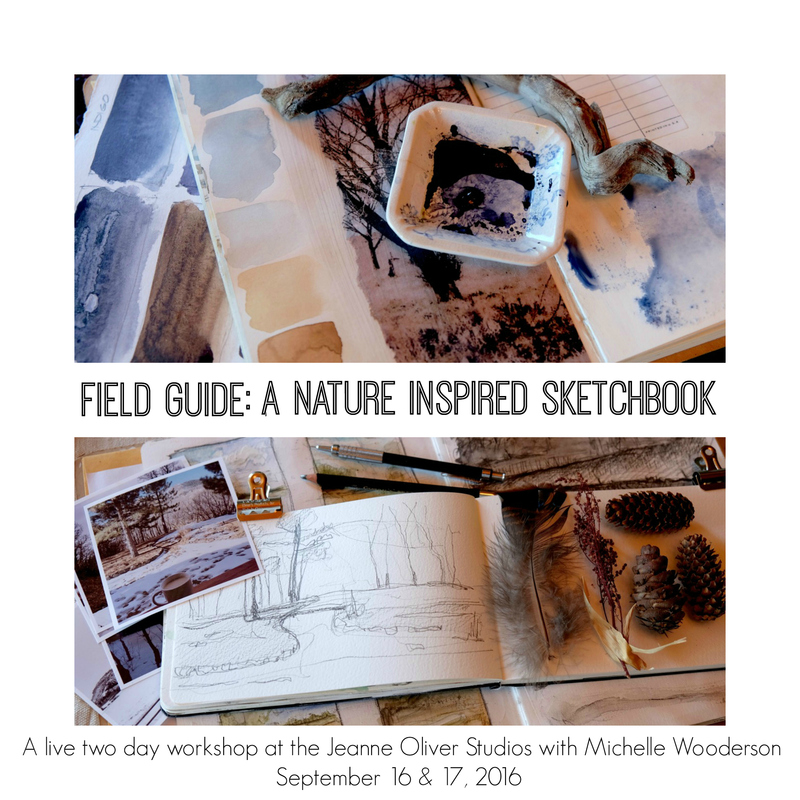 To purchase Field Guide for September 16 & 17th, 2016 as a TWO DAY EVENT. Today I had five children and three adults exploring our land. We were gathering flowers, branches and leaves. The kids were finding the perfect walking sticks. Every place we turned we found something new. We then came back to the studio and the kids made maps of the land and also painted or sketched some of the treasures they found out on the land. Inside I was beaming. It was the whole reason I wanted this land. I wanted a place to gather! A place to explore, make art and be present. Just simply connecting with what is around us is an honor and dream for me. It is something that we can do anywhere but on this new land of ours if feels so much easier and natural. After our exploring on our land today I am even more excited to announce the next live workshop in our studio! 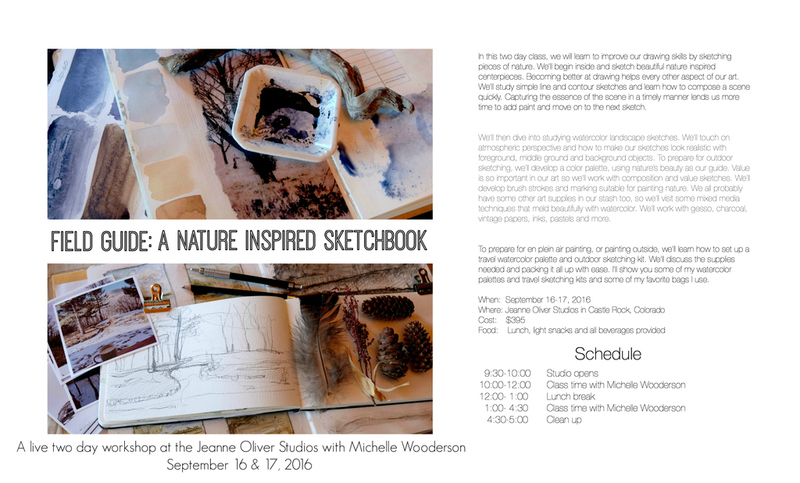 I would love for you to come join me on our land for a two day workshop this fall as we explore and paint with Michelle Wooderson. John Muir said, “The mountains are calling and I must go.” I feel that same calling to the mountains and am so thankful to be able to visit them every year. If you have a calling to get back to nature then this class is for you. 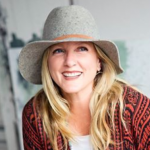 We will venture to Jeanne’s beautiful home in Colorado to study the mountains and nature while creating beautiful artwork. It sounds too good to be true, doesn’t it? In this two day class, we will learn to improve our drawing skills by sketching pieces of nature. 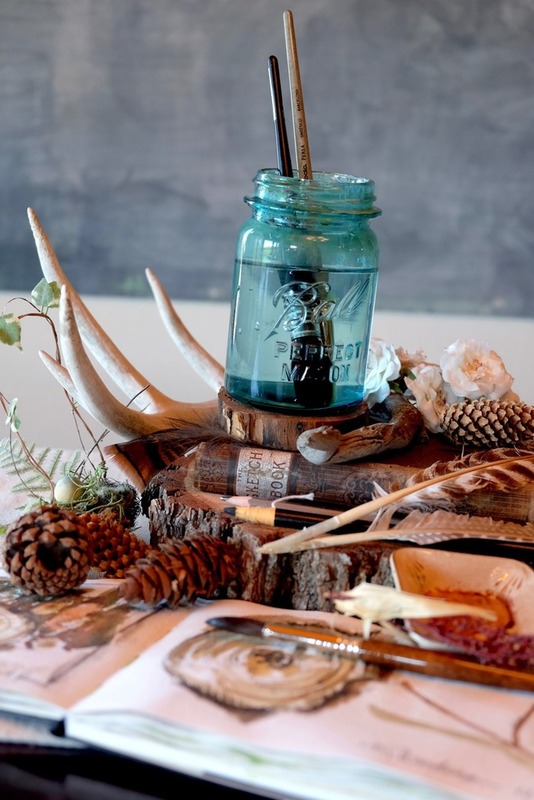 We’ll begin inside and sketch beautiful nature inspired centerpieces. Becoming better at drawing helps every other aspect of our art. We’ll study simple line and contour sketches and learn how to compose a scene quickly. Capturing the essence of the scene in a timely manner lends us more time to add paint and move on to the next sketch. We’ll then dive into studying watercolor landscape sketches. We’ll touch on atmospheric perspective and how to make our sketches look realistic with foreground, middle ground and background objects. 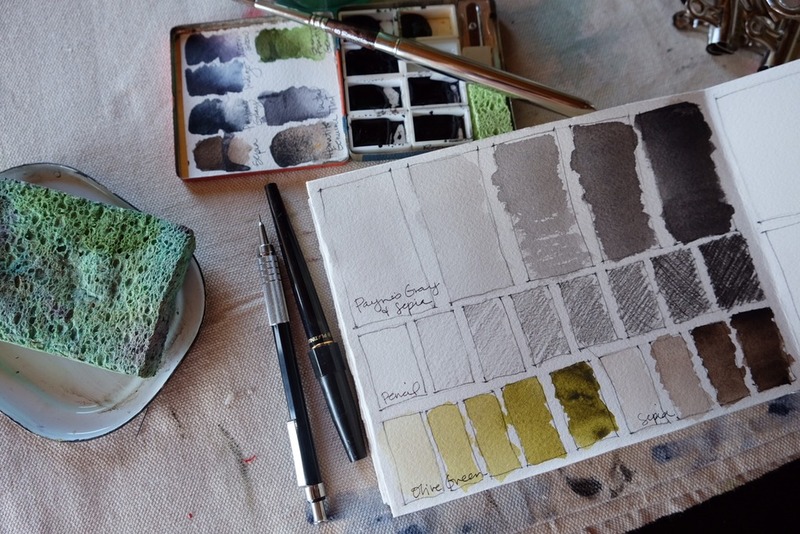 To prepare for outdoor sketching, we’ll develop a color palette, using nature’s beauty as our guide. Value is so important in our art so we’ll work with composition and value sketches. 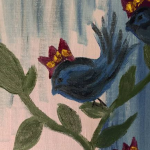 We’ll develop brush strokes and marking suitable for painting nature. 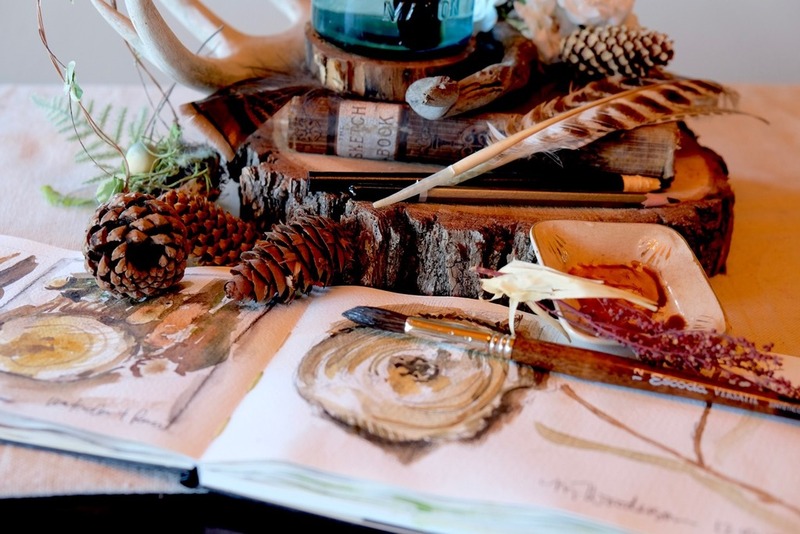 We all probably have some other art supplies in our stash too, so we’ll visit some mixed media techniques that meld beautifully with watercolor. 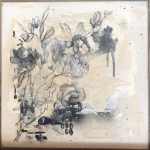 We’ll work with gesso, charcoal, vintage papers, inks, pastels and more. 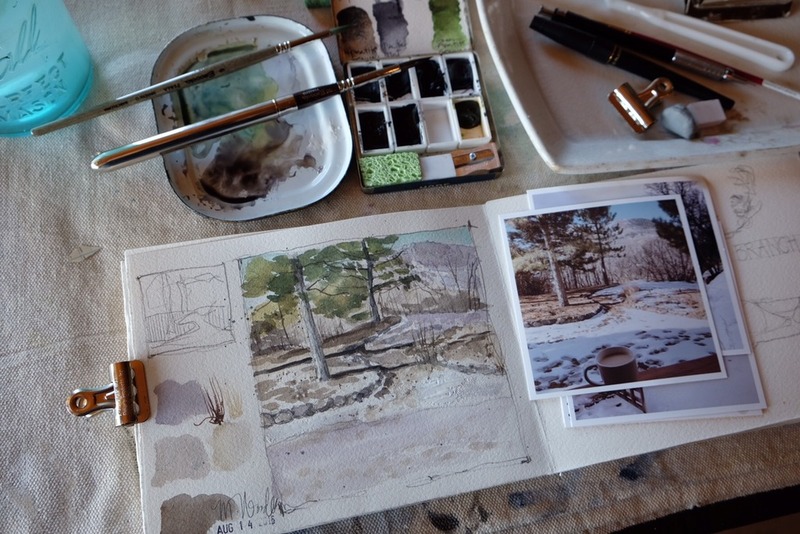 To prepare for en plein air painting, or painting outside, we’ll learn how to set up a travel watercolor palette and outdoor sketching kit. We’ll discuss the supplies needed and packing it all up with ease. I’ll show you some of my watercolor palettes and travel sketching kits and some of my favorite bags I use. While in beautiful Colorado, this will be the perfect time to develop an artist’s mentality that puts us in a wonderful mindset of needing to paint daily, practice often and to make creating art a habit. We’ll learn that each sketch is practice for the next sketch and that practice is art. Gathering with a community of like minded people can be so uplifting and inspiring. We’ll share where we are in our journey and where we plan to be one year from now. This might just be our favorite part…sharing in the journey with others. 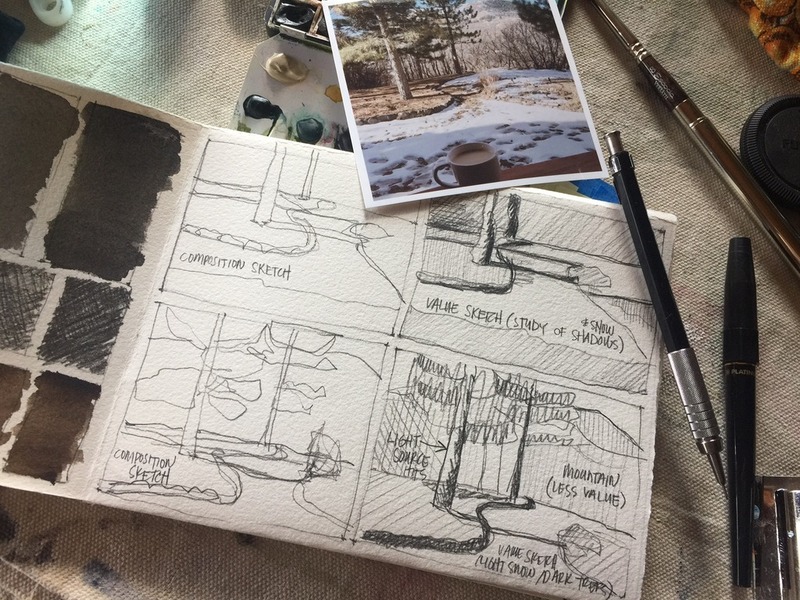 All of our practice lessons will prepare us to take out sketchbooks outside to Jeanne’s beautiful, wooded property full of trees and mountain views. 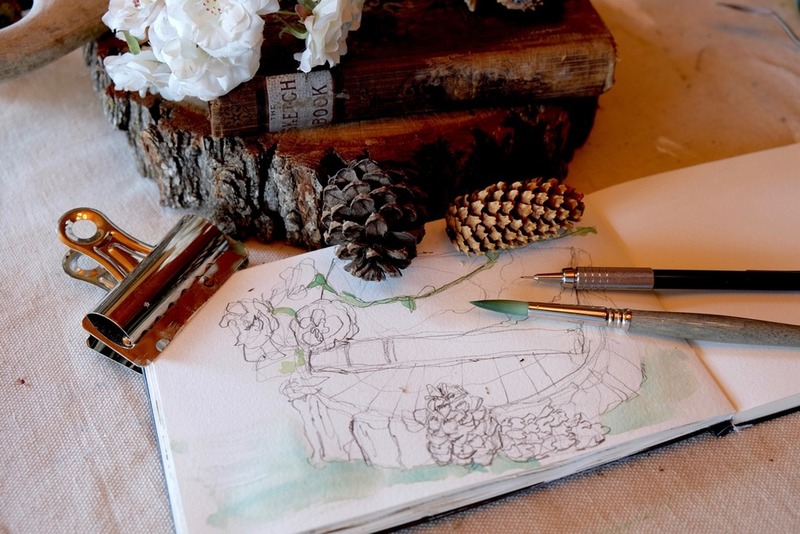 We’ll create a simple, no sew watercolor field journal that will house all of our beautiful sketches. It will become a wonderful resource and beautiful piece of art that you will take home to treasure forever. Each student will receive a fun goody bag filled with items to inspire your art. 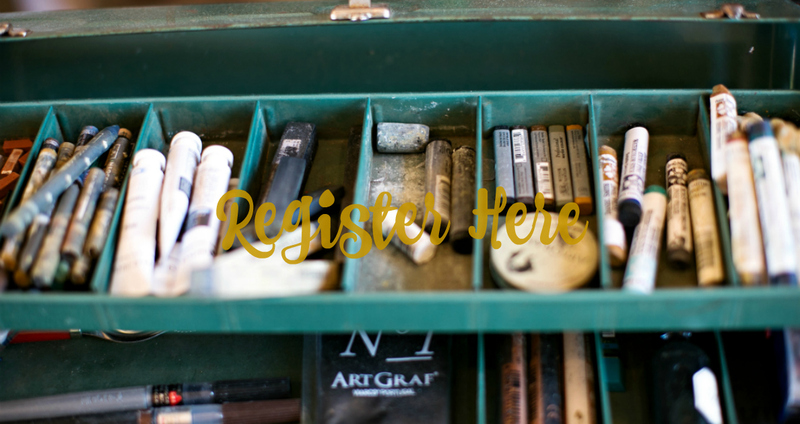 If you’ve wanted to travel and create art at the same time, this class is calling your name. Getting back to nature, creating art inspired by our beautiful Earth and being surrounded with artistic souls sounds like a little piece of heaven to me. 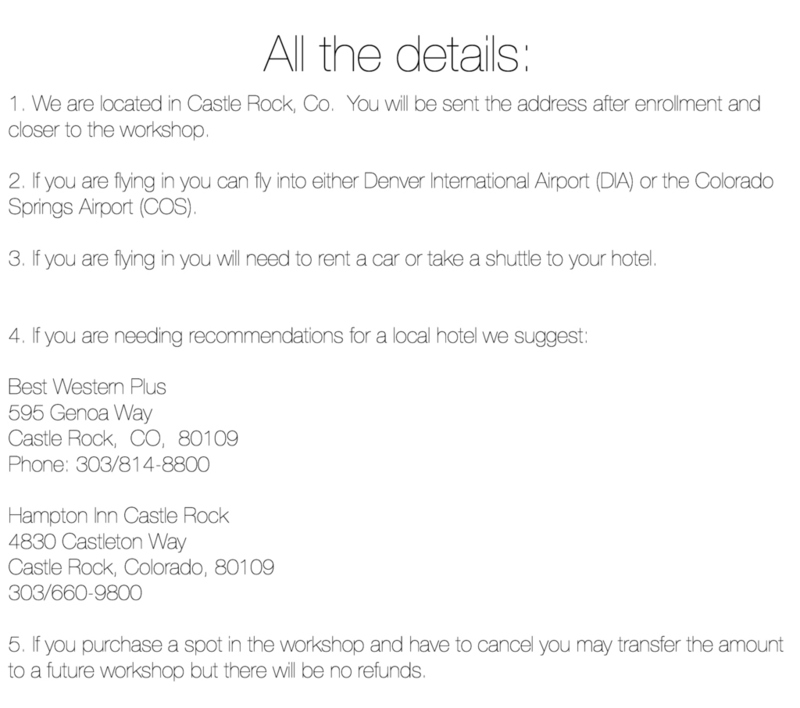 I hope you will join me in this exciting journey to beautiful Colorado. 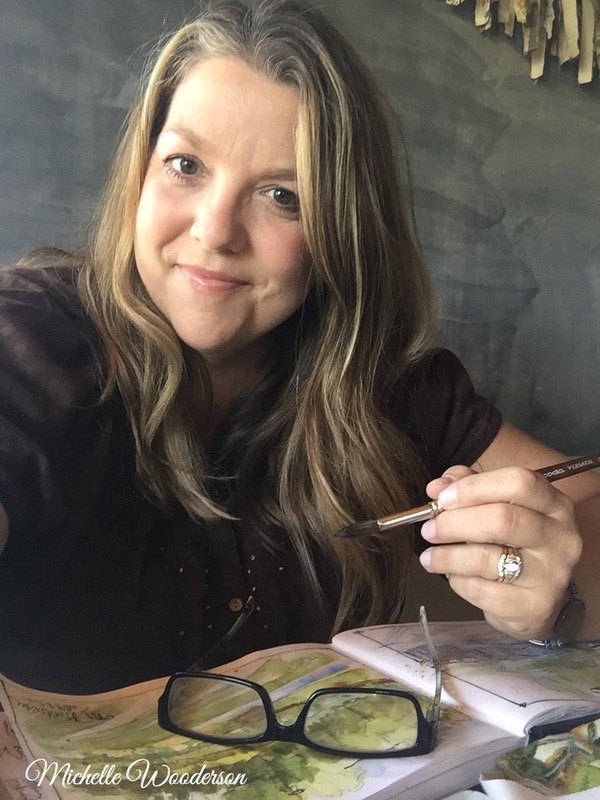 If you are curious, you do not have to take my Close To Home: A Watercolor Landscape Journey class to sign up for this class. 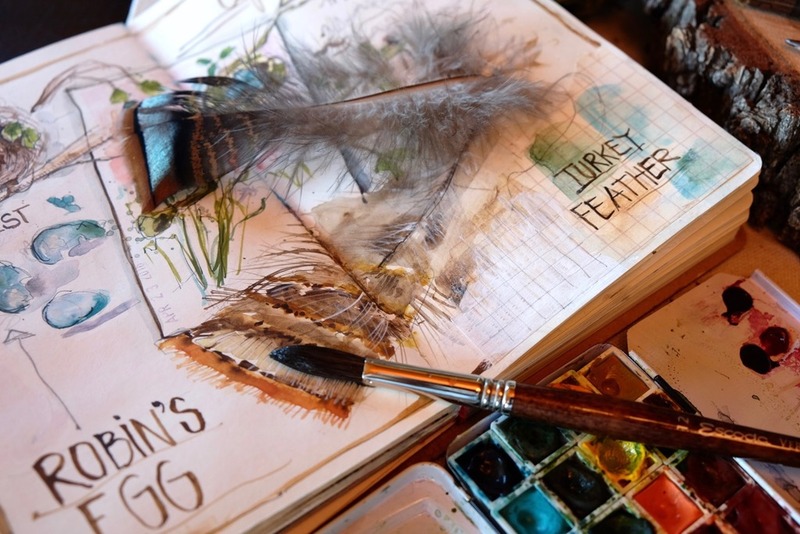 However, the lessons studied in that class could help you jump start the Field Guide: A Nature Inspired Sketchbook class. Watching the videos will help you with practicing some before class starts and you can learn more about supplies and setting up your travel kit. Watercolor Palette suitable and already prepared for taking outdoors to paint. Folding metal or plastic palettes are a good choice. 12-24 paint colors of professional artist tubes are suggested. You can view my 24 palette colors and how to set up a palette in the supply list of my Close To Home: A Watercolor Landscape Journey. You will need to prepare your palette and allow 24-48 hours for the paints to dry. For a less expensive choice, the craft stores offer ready to go palettes for around $20 or less. Small Spray Bottle-to rewet your paint palette. I get mine from the travel section at Walmart or Target. Watercolor Brushes-I suggest good quality brushes in a size 8 or 10 round, a ½” flat brush and a size 0-2 rigger brush. If you’re just experimenting with this class, then an inexpensive size 8 round brush will work just fine. Travel Water Cup-You can bring an old butter tub or look for collapsible water cups at art stores or online. There are several styles to choose from. Pencils for sketching-Suggested are a mechanical pencil with refill leads, .05 or.07 lead. Regular lead pencils with an assortment of leads would be nice for value sketches. You can purchase a small set online at places like Blick Art Materials. Lead ranges from H’s, HB and B’s are nice. A regular school pencil will work too for all the lessons. Charcoal Pencil-I like the kind where you can peel off the paper to reveal the charcoal. This is optional as a regular school pencil will work also. Watercolor Pad-This will be for practice lessons. Select a size you can travel with easily, like 8 x 10 or smaller. 300 gsm, 140 lb, cold press spiral pads can be found inexpensively at craft stores, online or Walmart. Use your coupon. Ink Pens-Optional, but if you like to work with ink for sketching then bring one along. I like my Carbon Platinum Fountain Pen. Search online and get some waterproof refill cartridges. You want to use waterproof ink because we’ll be adding watercolor washes. Lamy Fountain Pens and disposable Micron ink pens with various pen tips are other options. Sketching Bag-You will need a bag that you can take outdoors and will be packed with sketching supplies. Messenger bags have long straps that you can use to work hands free. Also look for hiking backpacks or purses with pockets and dividers. Camera bags have divided sections and lots of room. Select something light weight and that you don’t mind setting down in the dirt. An old school backpack will work. Pen and Paper Pad-Just in case you are a note taker. Or want Jeanne’s autograph. Camera-A small camera or phone camera is not necessary but might be nice for capturing photos you can work on when you get back home. Having photos is nice because you can use them as references for future paintings or print them off to work inside when the weather isn’t cooperating. Other supplies needed for our lessons will be provided for you . Please keep your supplies simple and use what you have. We want to focus on the lessons and learning, so any additional supplies are not necessary. If you are taking the class with a buddy, feel free to share supplies where possible. Oh man Jeanne! You are tapping into my greatest love! Too bad I cannot draw! I ADORE nature! Do you have to know already how to sketch to join the class? No! Come! You will love it so much. Hi Martha. This is the perfect class to learn more about sketching. We’re going to spend some time right off the bat learning some simple line techniques, practicing with beautiful still lifes from nature. I really really want to do this… Checking some scheduling stuff for my work, but can you squeeze one more in? Paula, we would love to have you! Email us at contact@jeanneoliverdesigns.com or follow the payment link on this blog post and we will get you in. Thank you. Paula, would love to have you join in on the fun! 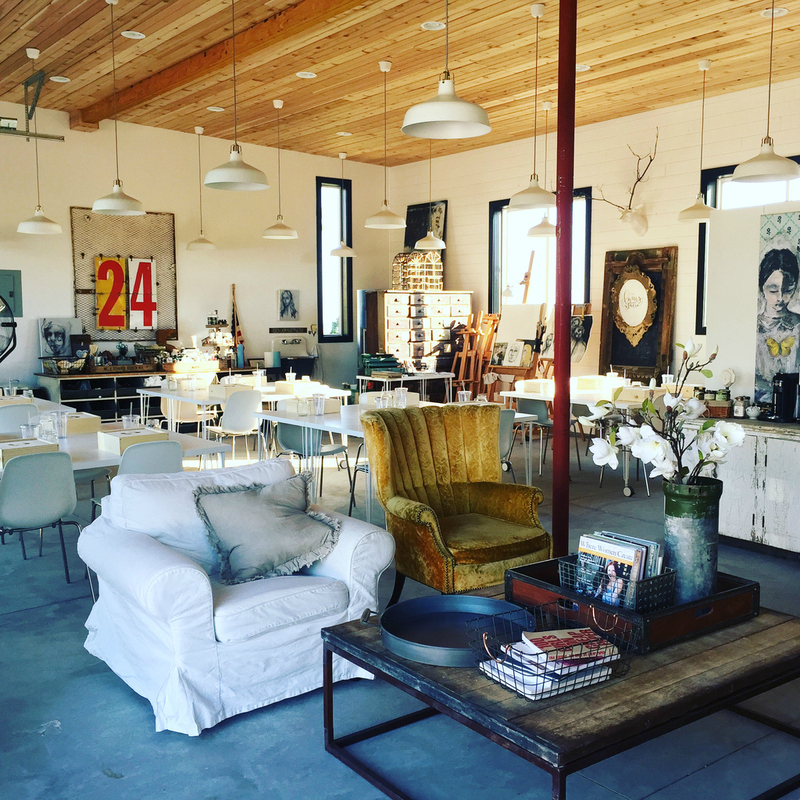 I’m so looking forward to this artistic adventure and there is no better place to start than at Jeanne’s beautiful studio.